With the lack of military presence (thanks; sequestration) at this year’s show I decided not to attend, but opted instead to photograph arrivals, practices and any other aircraft that may be passing through KEFD the Thursday and Friday before. Thursday brought a little bit of action starting with a NASA Super Guppy (B-377 SG/SGT) working the pattern with one touch and go, then circling around to land. This was my second time to see it in the air and my first to catch it somewhat head-on. I must admit it looks rather unusual from that perspective; almost like an alien head with wings. As the day progressed a B-52H from Barksdale AFB landed, a C-40 landed, and a pair of C-130Js (one from Little Rock AFB and the other from Dyess AFB) who were delivering equipment for the USAF Thunderbirds arrived. A little after 2pm the Thunderbirds arrived flying around the field (I believe) looking for points of reference for their show. A short time later an Albatross Seaplane flew in and some civil aircraft, both private pilot types and some business jets. We hung out till around 7pm with hopes of catching the arrival of the VFA-122 Super Hornet TACDEMO team, but that never materialized. By then it was getting too dark to wait any longer so we left. Later, a friend said he thought they arrived around 9pm. Friday started with the arrival of a C-17A that I unfortunately missed. It came in a few minutes before I arrived. About 10am the mini-show began that Wings Over Houston puts on each year for school kids. It included skydivers, warbird formations from Tora-Tora-Tora, and the Super Hornet demo. Shortly after the mini-show the Breitling Jet Team took to the skies for their media flight, making a few passes before landing. 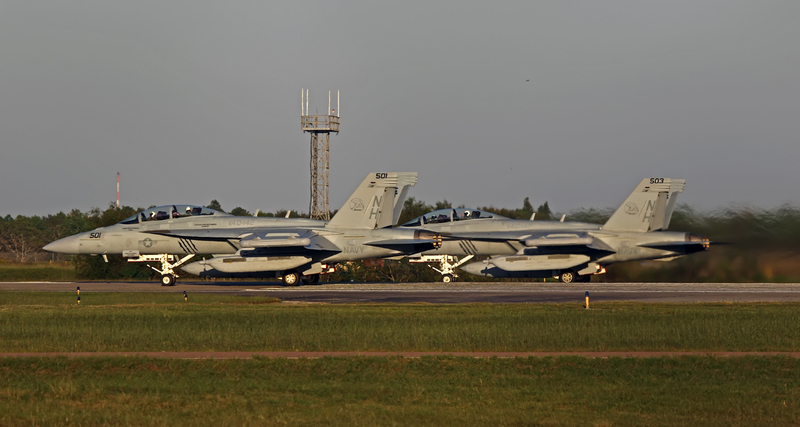 This was followed by the arrival of a United Airlines 737-900 for static display, the Super Hornet practice demo, Thunderbirds practice, a pair of E/A-18G Growlers from VAQ-142 who stopped by for a gas-n-go, a pair of F-5Ns from VFC-13 Saints, a B-17G and a Spitfire that is a new acquisition by the Lone Star Flight Museum. Mixed in were a few other warbirds to include a B-25, a Stinson, Mustang and a couple of 0-2 bird-dogs. Spotting on Thursday took place just north of the airfield off Genoa Red Bluff road next to a church. The only exception was the arrival of the B-52G which was shot from the south end, just east of RWY 35L. Spotting on Friday started at the north end (just like Thursday), but soon changed to the south end along Hwy 3 (Old Galveston Road). The hi-lights for me these two days was seeing the Tiger Stripped F-5N that has been on my must see aircraft list for the past two years and the pair of Growlers from VAQ-142 Greywolves, a unit I had not seen since they transitioned to that airframe. As much as I enjoy spotting I enjoy it that much more hanging out with others who share our passion. In no particular order it was great hanging out with Nathan T., Nathan B., Nathan F., Justin, Jim, Gerald, Gabe and Andy. Note: One of the fellow spotters mentioned is Andy Nguyen who is a friend of Dave Chng (owner and editor of this site). It was Dave who put him in contact with me so we could meet and hang out together. And man, am I glad he did. Not only is he one of the nicest guys around, he is a master photographer who was kind enough to share some tips that paid off. To Dave, thanks for arranging for us to meet. And to Andy, it was such a pleasure to get to know and hang out with you. I look forward to seeing you in San Antonio spotting the Randolph show next week.